Although our predictions about climate change are uncertain there are many ways we can make better choices while enhancing our gardens so that we become environmental stewards and so our gardens are better equipped to cope successfully with a changing climate. First and foremost, we can change our methods for handling water by treating water as the precious resource that it is — keep it on site. As rain is falling we need to slow it down and spread it out so that it penetrates our site deeply and so that we allow for the plants and soil to help clean the water before it enters one of our water bodies. Design and installation of permeable paving is an important step for keeping water on site as is the development of rain gardens. We need to avoid the use of invasive plants such as English ivy (invasive plants vary with regions of the US) which is killing many of our native trees. Focus on growing native plants, recognizing their beauty and importance in the food chain, their adaptation to the vagaries of our weather, their need for less water, and their critical role in healthy ecosystems. Using species of plants rather than complex hybrids with double flowers will assist pollinators as they need access to the nectar and pollen of the flowers. Encouraging genetic and species diversity will enhance the ability of plants to adapt to changing climates. Avoiding monocultures is a great step in increasing the biodiversity of our gardens. Biodiversity contributes to various forms of stability in a garden ecosystem. There are many beneficial adaptations we can create such as green roofs, vertical gardens, soil building, and layered planting combinations. Shading and evaporative cooling from tree canopies can reduce summer temperatures from uncomfortable to pleasant — the more trees added, the cooler it will be. Using mixed evergreen hedges to protect the house from winter winds can help keep the house warmer in winter. As home gardeners we do not need, nor can we justify, the use of toxic chemicals on plants or in our gardens. So much of what is going on in nature and in our gardens revolves around interdependent relationships — living things do not live or exist in isolation. We have opportunities to create thriving gardens that will have beneficial impact on our own health, enhance bird life, contribute to the health of our environment as well as helping to slow the human impacts on climate change. Nature is our best teacher. A multitude of insects abound in healthy gardens. Insects are needed to keep ecosystems working – to pollinate plants, to provide food for birds and other animals (as part of the food web), and to increase the overall biodiversity of our gardens. With urban and suburban gardens being so focused on neatness and simplicity, an insect hotel provides a fun way to attract and to shelter insects while also creating a kind of sculptural element that is appealing and beneficial at the same time. Insect hotels can provide places to breed, places to stay and rest, and provide hibernation habitats. They can be beneficial to domestic honeybees, bumblebees, solitary bees as well as moths, wasps, beetles, lacewings, hover-flies, ladybirds, and earwigs (many of these eat lice and mites that damage plants). Insect hotels are made primarily with recycled materials such as those that can be gathered around the house and garden. Consider old wood, drilled wood blocks, bundled twigs, bamboo canes, cones, hollow stems, bark, seed pods, straw, hay, cut grasses, paper, old leaves, stones, shells, clay pots, clay pipes, bricks, broken pottery and more. Avoid using metal and for the drilled wood make sure the wood is free of chemicals. To hold all of the materials a structure is needed as the base, sides and frame for the hotel; in the beginning using bricks as the building block is quite simple. Once a base is set then the sides start going up and materials are placed with the heaviest going on the lowest level. Pre-roll the paper and leaves, cut hollow reeds, twigs and bamboo prior to construction so that building can move along without distraction. 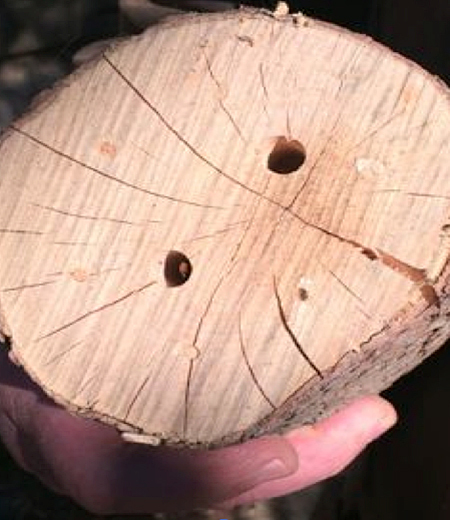 Create many small holes of different sizes in the untreated wood. Native bees like the tiny holes as a place to lay their eggs, add pollen and nectar on top and then they add clay for protection. Cavities are important for the insects to crawl on, fly into or to provide a resting place. Position the hotel where it will not get wet during winter, under the eve of the house, or build the hotel so it has a reliable roof – slate is a good roof material. Dry stone walls also act as successful insect hotels and often have the added benefit of providing habitat for chipmunks, frogs, toads, and salamanders. These are not built to be highly specific for certain insects but rather as a way to imaginatively increase the heterogeneity of your outdoor space. Insect hotels are quiet places most of the time so don’t expect them to be like Grand Central Station but do expect some surprises. By providing this kind of habitat we are adding rich natural features that support conservation. We create some garden art at the same time. A large part of the fun is to design the hotel so it is pleasing to the eye and then set it in place where it can be enjoyed and observed over time as it is discovered by insects. 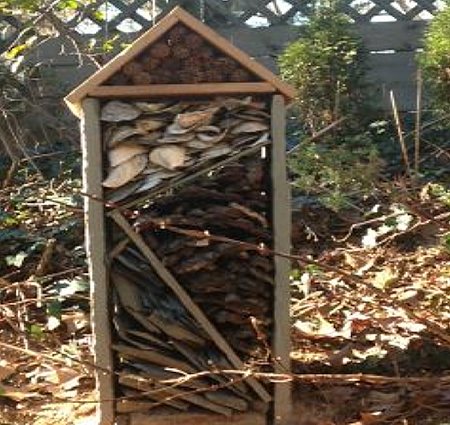 These insect hotels were made by Dr. Michael L. Smith, Ichthyologist, Beekeeper, Gardener. 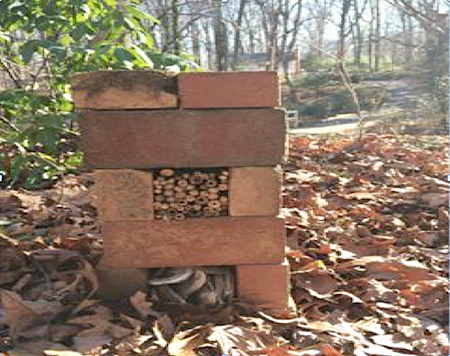 This is a simple insect hotel built with bricks – great for a first time effort. The spaces are filled with bamboo, twigs, and oyster shells. 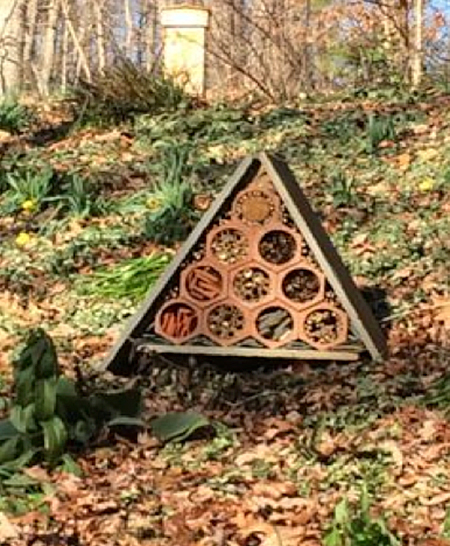 This more complex insect hotel provides a lovely sculptural element set on a hillside garden. The honeycomb design was created with brick pipe and slate is used as the base and sides. Here the design blends wood and slate set on a stone base and incorporates oyster shells, bark, twigs, and stones. This log has been part of an insect hotel. Look carefully to notice the very small holes that have been filled in with mud by native bees; these non stinging bees are good pollinators. An egg is laid in the cavity and then the bee adds pollen and nectar which provides food for the bee. Then leaf parts and mud are added to the top. Be sure to visit the Birdzilla.com home page for more information on birds and gardening. A well designed garden provides pleasure for humans and, if done with sensitivity, can simultaneously become a sanctuary for birds. Often times I hear people say that habitat gardens are messy and wild looking – this is not necessarily true. Habitat gardens can be aesthetically pleasing to humans while also providing food, water, nesting and perching sites, as well as protection for wildlife. I want to give you some tips for making your garden both a human and bird sanctuary. As I have become more interested and committed to creating my gardens as habitats for a host of birds, frogs, insects, and other life I notice the garden has become much more dynamic, interesting, and I find I want to spend more time observing all the activity happening within and around it. First I think about my own immediate region, living in the mid-Atlantic, along the Potomac River, and notice the kinds of plants that thrive, our soils types and rainfall patterns as this helps with selecting plants that will be happy in my own garden conditions. I like to create layers of plants beginning with tall trees, mid-story trees, then shrubs, followed by perennials, biennials and annuals. Arrangements for the plants will depend on the amount of sun/shade, moisture levels, and plant compatibility. The first step in creating a new garden is to decide where you want to create, enhance, or block the views. If you have ugly buildings in the distance you want to block then select a series of hedge plants that will grow to form an enclosure. Many evergreens are also great places for birds to nest and seek protection from weather and predators. My favorites are some of the native junipers, hollies, and pines – selection of plants will also greatly depend on how much space you have since pines, for example, need a huge amount of room to grow. Always decide on the placement and plant the large plants first because these will become too hard to transplant and the large and evergreen plants become the bones (structure) for the garden. If you are lucky enough to have great views then you need to design around the views to maximize their potential. Keep views open and if plants grow in the way of the view do not hesitate to prune them back. Part of the secret to keeping your garden beautiful is artful pruning, allowing the shapes, forms, and textures to be highlighted. If there are no great views then create one. 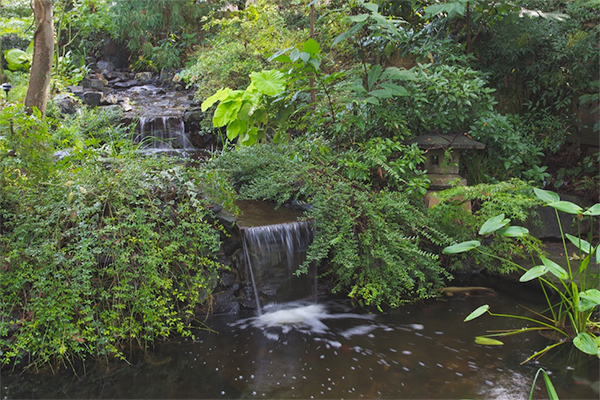 Here in the Shimizu garden you can see the stream created that is a favorite spot for birds throughout the year. 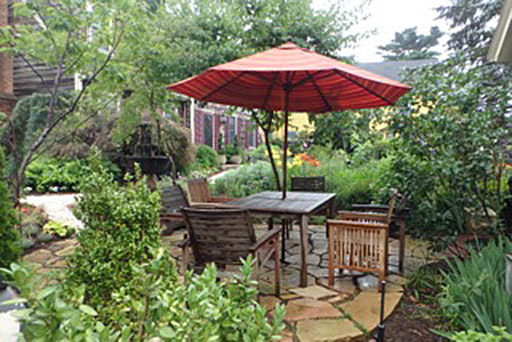 The surrounding garden is a combination of native and non-aggressive non-native plants where birds are able to nest. Borders of the Garden are planted with mixed evergreens including the native juniper (Juniperus virginiana), also called Eastern red cedar. The fruit is a staple for many birds and the foliage provides sites for nesting and cover – the cedar waxwing gets its name from this plant. American Robin. Photo by Neil Soderstrom. 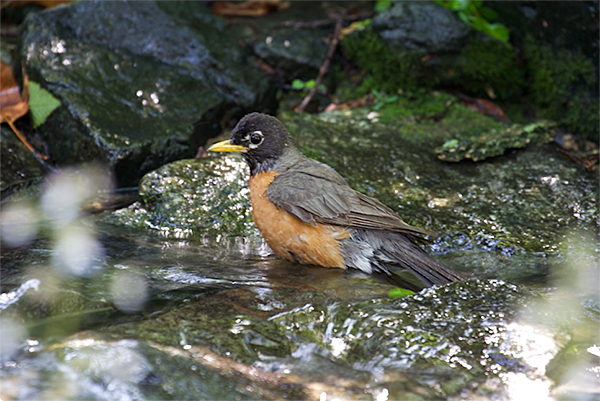 Birds are attracted to this stream for playing, bathing and drinking. The water is clean, we have a bio-filter (no chemicals) and it keeps running throughout the year so that it has become a favorite spot for many birds. Visit Birdzilla.com for more information on gardening, birds and habitat development. We are excited to announce that nationally-known horticulturist, consultant, and educator will soon be blogging on the Birdzilla.com web site. Holly recently retired as the Executive Director of the U.S. Botanic Garden. She was also Host of Victory Garden (television show on PBS) for ten years. You can learn more about Holly on her web site. 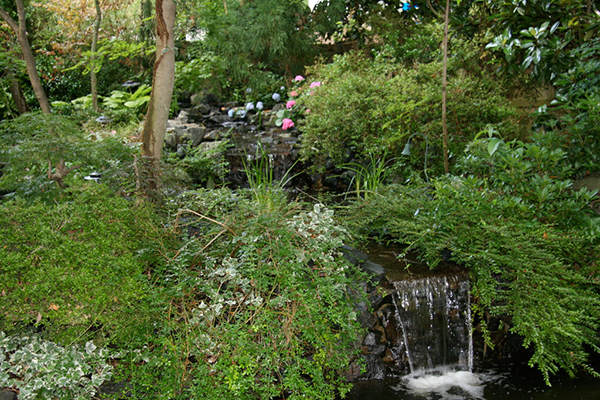 Holly’s waterfall/habitat garden in the spring. Copyright © 2019 Holly Shimizu's Blog All rights reserved. Amazing Grace theme by Vladimir Prelovac.